Hello. We are finally enjoying a little less humid weather. Nice wind blowing, and windows and doors open for the first time in weeks. Not to last though, so will enjoy it while we can. Today's card is for the challenge at Phindy's Place, which this week is Pretty in Pink. I love this gal relaxing in a bubble bath and her kitty right there with her. I colored the image with Copic Markers. The edge of the oval is distressed with Ranger distress inks. Corners are a punch by Paper Shapers. Flowers are by Prima. Lots of Stickles for the bubbles and flowers. Grosgrain white ribbon and bow. Nana's Nursery, girl, was the stack I used for the Papers. She looks like you! What a cute card, Sue - love it! Your new picture is wonderful too! What a gorgoeus image Sue! I love it. Your card is so cute. How relaxing! 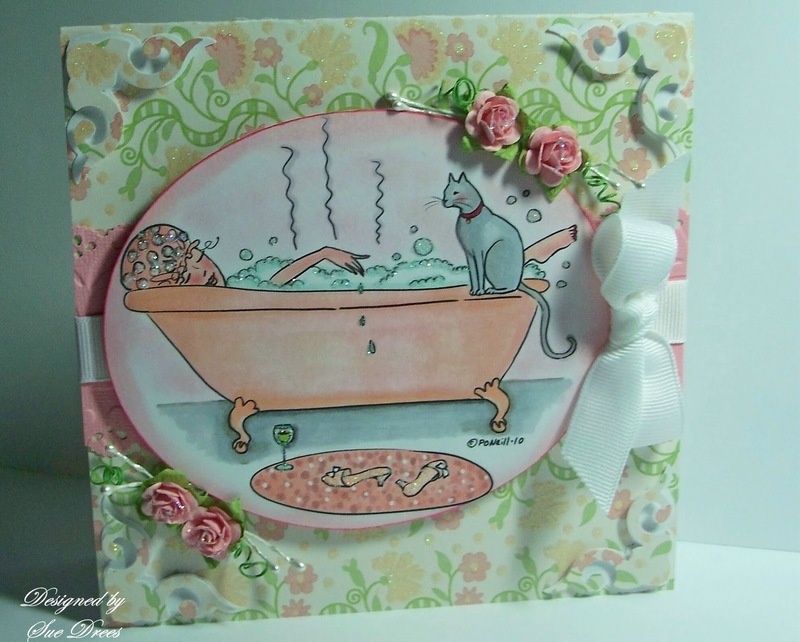 Love the colors, very pretty card, Sue! Sue, this is beautiful - so soft and dreamy. Gorgeous colors! Thanks so much for playing along at Phindy's Place. stunning and gorgeous new designs Sue! Such a beautiful card, Sue!! Love the soft relaxing colors. Thank you for joining us again this week at Phindy's Place!! Delicious card. So relaxing and calm. I love the papers and all your pretty embellishments. Thanks for joining us at Phindy's Place. Oh doesn't she look comfy? So pretty, Sue! So soft looking!